Since 2001 I have been a resident artist ... actually, I dislike the term artist ... I'm a photographer, at The Torpedo Factory Art Center in Old Town Alexandria, Virginia, across the Potomac River from Washington, D.C. Having a studio in one of the premiere art centers in the U.S. has given me the honor and privilege to meet people from all over the world. What amazes me more than anything is how many "photographers" I meet. Everyone who owns a camera considers themselves a photographer. My wife and I at one time owned a piano, but we never considered ourselves pianists. Seriously, I am not trying to be sarcastic or cynical. Just trying to prove a point about what I see going on in photography. Everyone is a photographer! These are exciting times when it comes to photography. Never before have so many people been making images. Finally, due to technological advances, photography and the image making process (i.e. digital cameras and printers) is accessible to the masses. This brings to mind a term from ECONOMICS 101 ... "barriers to entry." What this refers to are the obstacles that get in the way or obstruct a person or company from entering a specific market. For example, auto manufacturing has extremely high "barriers to entry" ... financial, engineering, ruglatory, etc. Not too many years ago, the "barriers to entry" in becoming a photographer were somewhat steep. There were equipment costs (4x5 to 35mm systems), owning a darkroom, working knowledge of photographic chemicals and film and of course the ability to make technically competent, well composed images. Today, most people own a computer, a digital camera and color printer ... bingo ... you're in business! Digital cameras have auto exposure, auto ISO, auto focus, face recognition and vibration reduction. Heck, you don't even need a tripod! As you can see, today the "barriers to entry" with respect to photography are relatively low. Taking into account that just about everyone today has the ability to make images/art, this has created an unbelievable paradigm shift in photography and the arts. The amount of images being made today is mind boggling. We as photographers have only scratched the surface ... stay tuned! Susan Sontag, in her 1977 book "On Photography" writes about photography's role in society from the perspective of the 1970s. She speaks of how photography has contributed to our becoming voyeurs due to the amount of images being made as of the 1960s and 1970s, as well as their genre. She also discusses photography's relationship to politics. "On Photography" is a heady read, but considering the book was written in the 70s, it is as relevant today as it was then, especially with respect to photography's impact on culture. Think about it ... from the moment we awaken we are bombarded with imagery, both print and electronic. I'm getting dizzy! I want to leave you with a thought ... based on the principles of supply and demand, does photography have the same intrinsic value that it had prior to the digital revolution? Your comments are always welcomed. I've noticed in the past few years that prints have been getting much larger. Some are framed, while others are mounted on aluminum or face-mounted to plexi-glass. This is true for color as well as B/W prints. What has happened to the intimacy between the viewer and the image? Most contemporary photography is printed large 30" x 40" and 40" x 60." Kenna. By today's standards, Kenna's prints are relatively small; approximately 7.5" x 7.5" gelatin silver prints matted 16" x 20" printed in editions of 45 ... postage stamps in comparison to the works of Andreas Gursky, Hiroshi Sugimoto and Edward Burtynski. Kenna was interviewed for "THE PHOTO REVIEW" by Dean Brierly in 1997 for an article titled: "In the Darkroom with Michael Kenna." When asked if he ever prints larger, Kenna's response was, "No. I prefer the intimacy of the smaller print. I experimented with 16" x 20" prints in the late 80s but later destroyed most of them. Some collectors really like them but they just didn't feel right for me. Apart from the more obvious technical and optical considerations, what is more important for me is the relationship that a viewer has with the print. The eye comfortably views and focuses an angle of about 30 degrees. This translates into a viewer comfortably standing about 10 inches away from a 4" x 5" print and 3.5 feet away from a 16" x 20" print. Small prints have a greater feeling of intimacy - one looks into the print. Large prints are more awesome - they are something a viewer looks out at. I believe in fitting the print size to one's particular vision and prefer the more intimate engagement of the smaller image." It was not so long ago that a 16" x 20" print was considered fairly large. 20" x 24" prints were considered very large. I can recall an instance about 15 years ago, when a client purchased a 40" x 40" print. At the time, due to technological limitations, I had a commercial lab make an 8" x 10" copy negative of a 20" x 20" print so as to enable them to make the large 40" print on roll paper. The original negative could have been enlarged at the lab, but there was so much print manipulation (dodging and burning), that I thought it best to copy a finished print rather than have a stranger try to interpret my negative. Today is entirely another story ... either capture the image digitally, or capture an image on film, scan the negative and print on a large format ink jet or light jet printer that ranges in size from 17" to 104" in width. What a world! Bottom line ... In my opinion, the desire to print large-scale is driven by the fact photographers now have a technology that has expanded his or her creative vision in ways unthinkable 10 years ago. Some imagery just looks better at 30" x 40" than it does at 16" x 20." We have essentially moved away from the so called "intimate" relationship we had with an image to one of an in-your-face life-like visual experience. It's sort of like going from pager technology to IPhone 4 technology over night! When Dean Brierly asked Michael Kenna if the pendulum is swinging back towards smaller prints, Kenna says, "I honestly don't follow the photography world enough to know what is going on. But as you say, it is predictable that if big prints have become popular, there will be a pendulum swing away from them. As there are always dedicated followers of fashion, we also know the grass is always greener on the other side." Keep in mind this interview was in 1997 ... almost at the very beginning of photography's digital revolution. I've been thinking about starting a blog for quite a while. The big question I faced is what to blog about? So many photography blogs focus on process and technique. Now, all of us photographers are in some ways interested in cameras, lenses, film, inks, papers, film/digital and PhotoShop. Photographic technology and process are great, but there is more to image making than the actual process by which we all make images. For me, photography is about communicating my vision. Cameras, inks, papers, films and software are only tools which help me communicate that vision. Keeping the theme of communicating personal vision in mind, it's a good time to talk about one of my heros, Chuck Close. Just recently I finished reading the biography of Chuck Close ... "CHUCK CLOSE LIFE" by Christopher Finch. Close is an amazing artist and individual. Aside from the fact that he has been a quadriplegic for 22 years and continues to be at the top of the contemporary art world, photography has played a significant role in his art. He has a tremendous admiration for photography. His use of photography and understanding of the medium led me to do a bit more research into his personal views on the photographic art form and how it pertains to his personal vision. 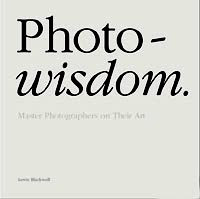 I came across a book titled, "PHOTO WISDOM: MASTER PHOTOGRAPHERS ON THIER ART" by Lewis Blackwell. The book is a compilation of artist's statements about their work, process and creative vision. The book includes statements by such notable photographers as Michael Kenna, Loretta Lux, Mary Ellen Mark, Elliott Erwitt, Edward Burtynsky, Joyce Tenneson and Chuck Close to name a few. Close really hit a nerve when discussing his attraction to photography ... He states "the thing that interests me about photography and why it's different from all other media, is that it's the only medium in which there is even the possibility of an accidental masterpiece. You cannot make an accidental masterpiece if you're a painter or a sculptor. It's just not going to happen. Something will be wrong." He goes on to explain that "this is photography's great advantage and its Achilles heel: it is the easiest medium in which to be competent. Anybody can be a marginally capable photographer, but it takes a lot of work to learn to become even a competent painter. Now having said that, I think while photography is the easiest medium in which to be competent, it is probably the hardest one in which to develop an idiosyncratic personal vision. It's the hardest medium in which to separate yourself from all those other people who are doing reasonably good stuff and to find a personal voice, your own vision, and to make something that is truly, memorably yours and not someone else's. A recognized signature style of photography is an incredibly difficult thing to achieve." In closing, Close says "photography's not an easy medium. It is, finally, perhaps the hardest of them all." And I thought painting and sculpting was difficult!